Inborn errors of metabolism (IEM) constitute inherited enzyme or transport protein defects, potentially leading to accumulation of toxic substrates or deficiency of essential products of any given process. There are often further consequences of the primary perturbation, leading to compensatory physiology or further interference in cellular processes. These biochemical effects can, in some instances, lead to fetal developmental abnormalities and in others to dramatic postnatal compromise with significant mortality and morbidity. 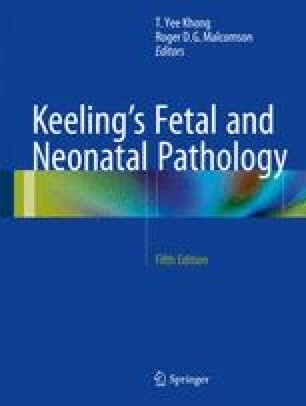 This chapter discusses the following presentations: neonatal acute metabolic encephalopathy, neonatal epileptic epilepsy, liver disease, cardiomyopathy, nonimmune hydrops fetalis, and dysmorphic IEM (including some lysosomal and peroxisomal disorders and congenital disorders of glycosylation). Systematic investigation of these clinical presentations can often lead to a definitive diagnosis. Most of these disorders are rare, but recent medical advances have made many treatable. It is therefore imperative that these disorders are considered early in differential diagnoses, investigated rigorously and expeditiously, and managed appropriately. Newborn bloodspot screening protocols can also identify many of these conditions in the presymptomatic stage, and hence, knowledge of local screening strategies is imperative for those investigating neonates. Screening tests require definitive testing algorithms in order to correctly identify an affected infant.